These days, bad thoughts tend to be conjured up when people hear the word “bootleg” or “pirate” in the same phrase as videogames. Glob tops instead of actual rom chips, plastic cases that easily break when you attempt to remove them from your gaming device – yes, these are the stereotypes that circulate around regarding the forbidden fruit of gaming. Then there are the other pirate carts, the ones that are so obviously fake that everyone receives a good chuckle when seeing them. From misspelled words to silly pictures, there is no limit when it comes to pirate carts. Shoddy craftsmanship doesn’t always extend into the realm of knockoffs, though, and that is what this article hopes to display. Here are some pictures from my favorite line of pirate Famicom cartridges. The quality is quite unbelievable. 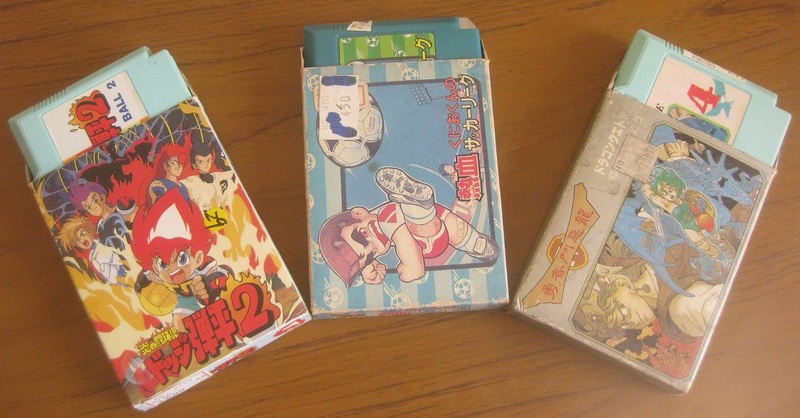 To begin, each cartridge was packaged with a cardboard box, much like a legitimate Famicom game cart. 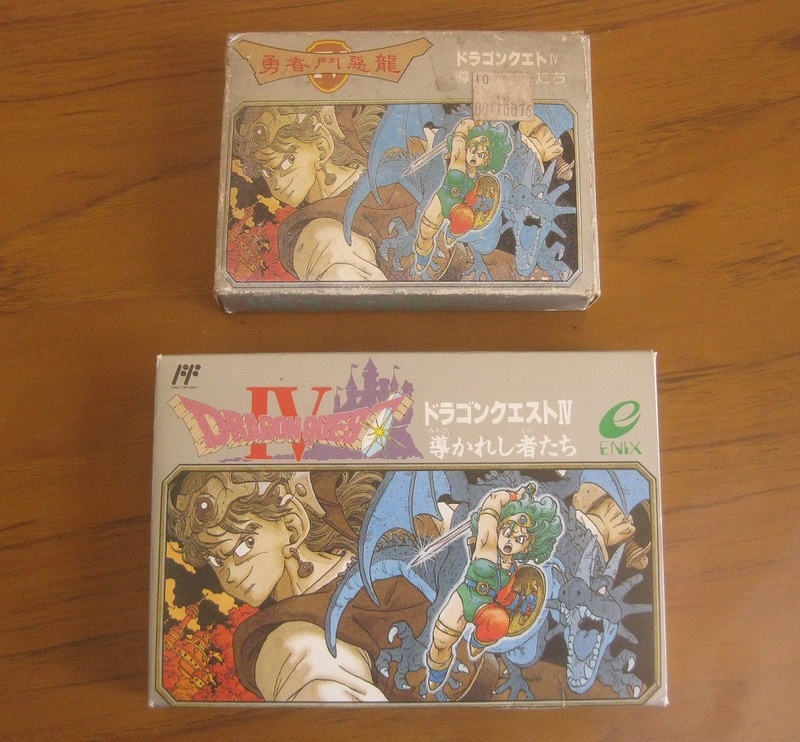 The fake boxes are quite a bit smaller though, and as a comparison, one can view pictures of a bootleg Dragon Quest IV [top] and a legitimate version [bottom]. 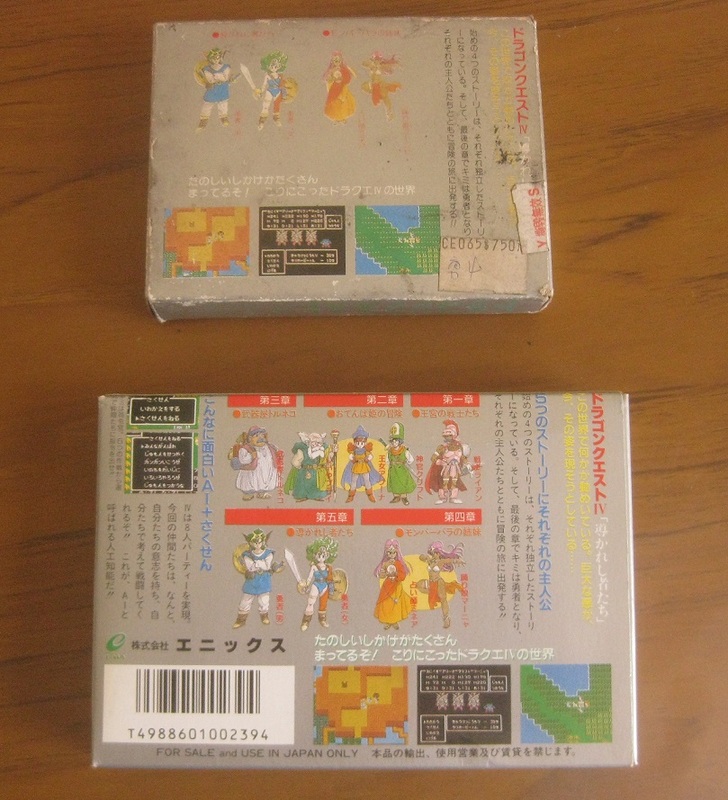 The back of the box also steals elements from a real Dragon Quest IV box, though due to the size difference, some items have been dropped. Before comparing the two cartridges, I just want to take a brief moment to discuss the situation with bootleg game boxes. Nowadays, it is quite rare to find bootleg games with their original cardboard boxes. In addition to many boxes being mangled and trashed due to improper storage, eager tiny fingers, and natural disasters, a lot of the old bootlegs never even came with boxes. A lot of times, game shops had the option of purchasing boxes and carts, or just loose carts. Due to the latter option being cheaper, it was quite popular, especially after the popularity of the Famicom started to wane. And that just makes me love these “boots with boxes” all the more. 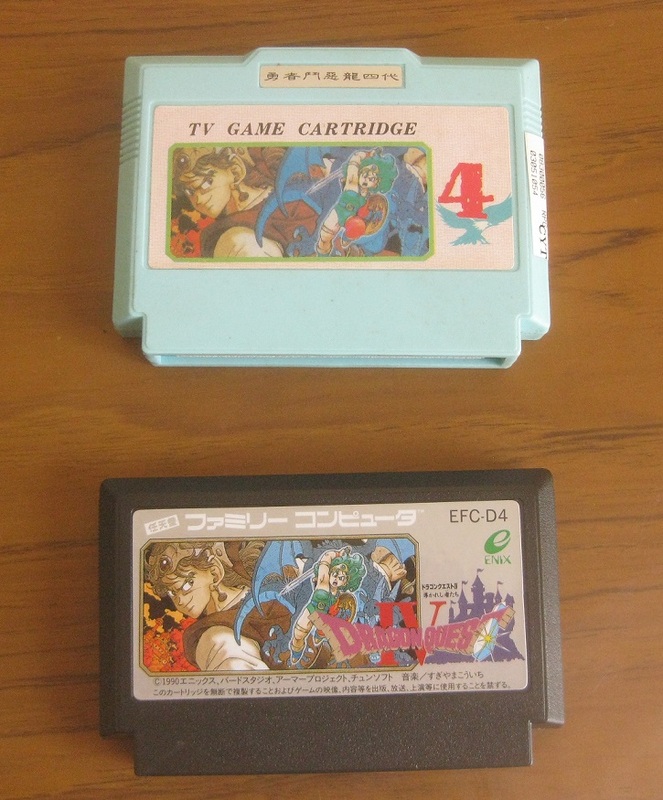 A quick comparison of the two game cartridges shows that the pirate cart is actually larger than its legitimate brother. The plastic used to make the game shells is quite thick though, and sturdy. The board is full sized, and of course contains real rom chips. Simply put, this cart is solid as a brick, and is built just as well as a real Famicom cart. I have no idea the actual name of the company that produced these cartridges, but they seem to have produced a nice handful of games. Dodgeball 2, the Kunio soccer game, Dragon Quest IV, Koei strategy games, multicarts, etc. – if there was a market for the game, it probably saw some sort of release. 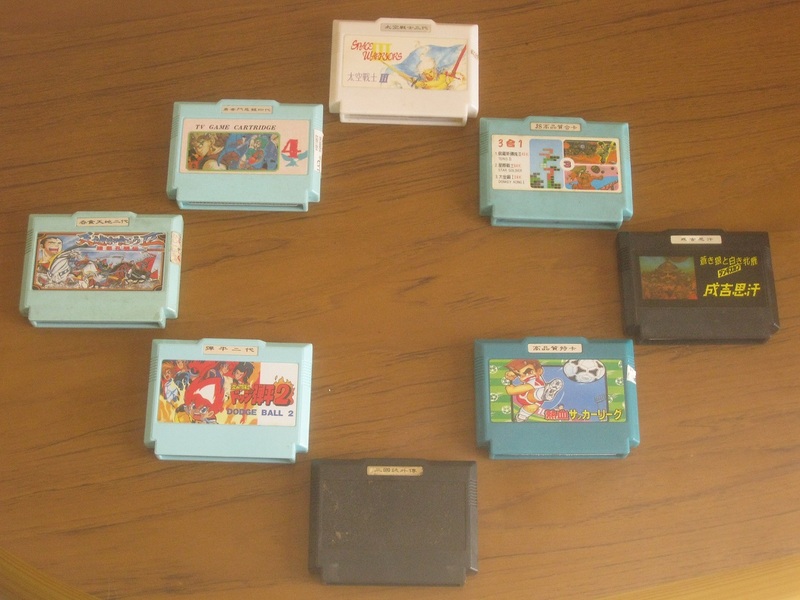 Below you can see a picture of the carts that I currently own from this company. Even the 3 in 1 multicart looks a bit more professional with its label design than some of the carts that I have seen. And for those who are curious, the cart sans label is one of the Romance of the Three Kingdoms games. Typically, pirate carts aren’t as good as the real version. There can be a million different quality issues going on with bootleg carts, and you never can be sure about the quality of the product you are going to receive; however, some companies did take the time and effort to make a quality product, even if it was meant for the black market, and those carts are worthy of being recognized.